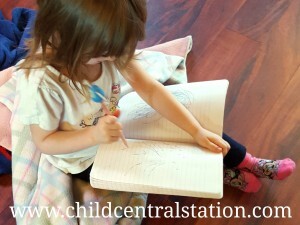 Children always choose when they would like to journal. This means that sometimes there are many children, but often it is an individual exercise. Our journals are simple composition books that I tend to stock up on when there are back to school sales. They aren't anything fancy, but each child has their very own. I label them on the front with a photo and the child's name so that they can easily independently retrieve their own. The children have an opportunity to decorate their journals as they wish--- many of the children choose to cover them with a myriad of stickers. 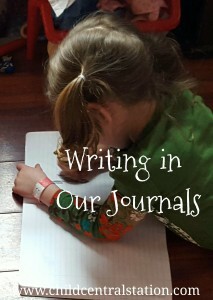 There is not a day that goes by where our journals are not in use... in fact they are used multiple times a day by most of the children. There is no handwriting instruction, there is no prescribed time or learning activity connected... 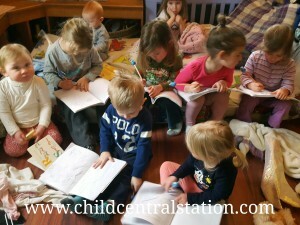 There are no rules about which pages need to be filled first or that you have to use the whole page before moving on to the next... Each child has complete autonomy over their own journal. None of the adults write anything in a child's journal unless a child asks them to (this rarely if ever happens). 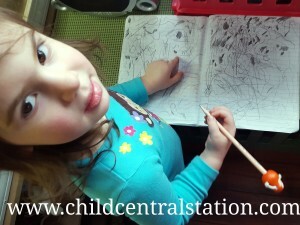 The children often revisit the same pages to add more "writing." How do you promote child directed writing in your classroom?